Thanks to everyone who deputed on Monday, June 16th to the Affordable Housing Committee and spoke in favour of the Use It or Lose It bylaw. A request for a staff report on Use It or Lose It passed without controversy, so now the City will have to decide whether and how to implement our proposal. A staff report signals that the City is taking seriously the possibility of adopting the bylaw. City staff will now do their own research on the issue to confirm its viability in Toronto. Councillor Vaughan has stood up for the importance of this project and will be able to help shepherd it through subsequent debates at the Affordable Housing Committee, and hopefully in Council if the bylaw makes it into Housing Opportunities Now - the affordable housing framework the City has been working on throughout the year - that will likely come to Council in the fall or early winter. Abandonment Issues has been working hard over the past few months, conducting and compiling research on Toronto's unique abandonment issues. We are excited to release our policy brief outlining the city's need for the Use It or Lose It bylaw and issuing recommendations for how this bylaw would best be implemented. Please support this campaign by attending an event launch for the bylaw that we are currently organizing for mid-May 2008. We need massive community support to show City Council that Toronto supports this initiative as a way to directly address the affordable housing crisis that has left thousands insecure and unsheltered. We will post details shortly on this event and hope to see you there. We will also be posting more information on how you can let the City know that you support the Use It or Lose It bylaw. It's been a few weeks since our campaign launch, and we've been busy. We've met with one of the directors of the City's affordable housing office, we've begun to put together our proposal for a Use It or Lose It bylaw, and we're participating in a number of housing advocacy events (including a forum organized by Housing Action Now, taking place this morning at City Hall, which features an Abandonment Issues representative). The next step is a big one--to support the campaign we need to do a lot of research. We need to expand our list of properties, find out more about them, look into local and international precedents for Use It or Lose It and other types of expropriation, and actually write a potential Use It or Lose It bylaw. If any of this sounds interesting, please join us on Monday, December 3, at 6:00 PM, at Tequila Bookworm at 490 Queen St. W. for a research meeting. A tentative agenda is provided below. If this doesn't sound interesting, don't worry--we'll be announcing some other ways you can get involved in a little while. If you have any questions or feedback, please don't hesitate to send an email to abandonment.issues@gmail.com. Is it a candidate for housing? Does it allow City to expropriate in order to sell, or only in order to build? Help solve Toronto’s abandonment issues! to be expropriated and turned into affordable housing. We want our research to support a campaign for a Use It or Lose It bylaw that would see abandoned buildings expropriated by the City redeveloped as affordable housing or community infrastructure along socially just lines. This project is about mapping missing housing and social centres, but it is also a critique of gentrification, neighbourhood blight, and the local and global forces that cause both of these problems. Through this project we hope to promote awareness of how the issue of abandoned buildings, and the lack of affordable housing and social services are connected to larger patterns of displacement and instability that stem from social and economic inequality. 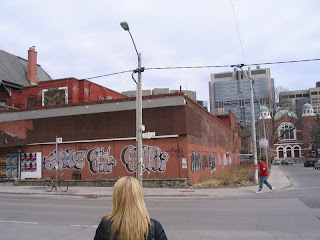 the Toronto Free Gallery and various sites throughout the city. For more information on “A Potential Toronto” mapping project, please visit http://tsci.ca/. Abandonment Issues is also supported by St. Christopher House, PARC, Multi-Story Complex, the Women Against Poverty Collective, and ACORN. Public ownership - owned by the City of Toronto, Province of Ontario, or Government of Canada, or by organizations closely linked to government e.g. TTC or TPA. Private ownership - owned by for-profit businesses, or by private owners. Semi-public / Institutional ownership - owned by organizations such as hospitals or universities, or by groups with Boards of Directors and any government funding. Derelict buildings – where the landlord has let the building fall into a state of extreme disrepair, and there are often very few tenants occupying it. Boarded up – where the building is clearly closed up; we want to know these addresses, but also, if possible, how long the building has been out of use and who were the previous owners. For sale – where the building has been for sale for an extended period of time, and it is languishing on the market. Schools; Single-family dwelling; Apartment building; Church or other centre of worship; Community Centre; Other institutions; One more floors of high rise tower, etc. Abandonment Issues is a Toronto-based coalition of housing activists fighting to get abandoned and underutilized buildings and spaces in the city turned into affordable housing. Abandonment Issues has drafted a Use It or Lose It bylaw that lays out the framework for implementing this goal.